Heat the oil in a large frying pan and then gently fry the sliced potatoes until almost soft, stirring from time to time so that they don't burn on the bottom of the pan. Add the onion and the green pepper and continue frying until all the vegetables are soft. Drain the vegetables in a colander to get rid of the excess oil. Beat the eggs in a bowl and season with salt and pepper. Add the potatoes, etc. and mix well and check seasoning. Heat a little oil in a frying pan on a moderate heat. Pour in the potatoes and eggs and shake the frying pan from time to time so that the omelette doesn't stick to the bottom. Once the bottom of the omelette has set, turn the heat down low and cover the pan. After about ten minutes, turn the omelette by placing either a flat plate or saucepan lid on the frying pan and quickly turning over. Gently slide the omelette back into the frying pan and continue frying, once again shaking the pan from time to time so that it doesn't stick to the bottom, until it has set all the way through. If it's your first time making this omelette, cover the eggs and potatoes with a lid as soon as you add them to the frying pan. This will help the top set slightly before you invert the omelette onto a plate. 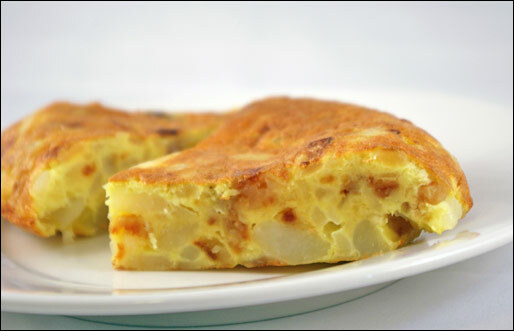 Tortilla de patatas (as this dish is know in Spain) is basically a potato omelette (about 4cm thick). 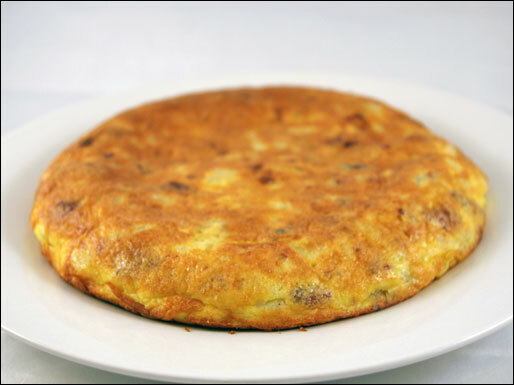 It is popular all over Spain and often served in bars as a tapa and is eaten either hot or cold. Some people prefer to make it without the onions or green pepper which more authentic but less flavorful. Mr Breakfast would like to thank Terry for this recipe. Recipe number 8. Submitted 4/12/2002.